Three UV4 VS vacuum pumps are improving the process by reducing to 50% the time required to load the production line with polymers. The new system is in Multimaster configuration with sequential running of each unit, where two pumps are in operation within the frequency range of 35 to 60 Hz, one is on stand-by. 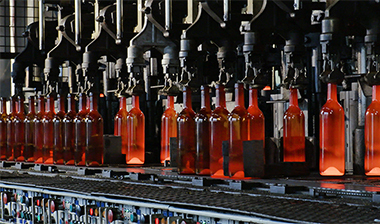 The ambient temperature can reach 50°C, the machines’ ventilation was sized accordingly. Installation in Mexico. As old as the invention of writing, glassmaking is accompanying the human history since its early beginnings. To draw the public’s attention to the idea of glass as an ‘eternal’ tool, Pneumofore sponsored the exhibition “Pretiosa Vitrea - The Art of Glass Manufacturing in The Museums and Private Collections of Tuscany”, held from 17 October 2017 to 29 January 2018 at the National Archaeological Museum of Florence, Italy. 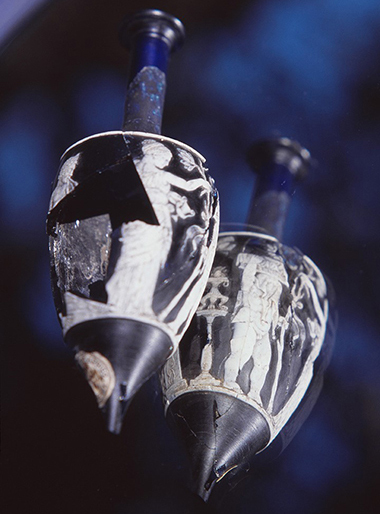 The project, made possible by the financial contribution of Pneumofore, gives prominence to the evolution of glass manufacturing in history through the display of ancient and rare glass artifacts, nowadays preserved in state museums and private collections. Promoted by the Sehen Foundation in collaboration with the Archaeological Museum, the exhibition is held under the patronage of the Italian Ministry of Cultural Heritage and Activities and Tourism and it is accompanied by a content-rich catalogue (ISBN: 9788874398041). Pneumofore, strongly committed to the glass industry and cultural responsibility, promptly supported the rediscovery of this prestigious glass heritage whose significance is invaluable. With recent sales in Brazil and Colombia, Pneumofore is further expanding its presence and commitment in the Latin American can industry. 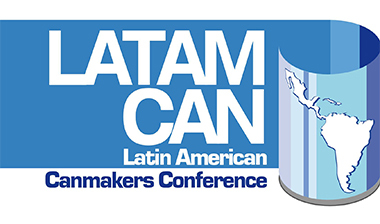 As a leading supplier of centralized vacuum and air systems in the region, Pneumofore will be also among the keynote speakers at Latamcan 2017, the technical conference for canmakers and suppliers operating in the metal packaging sector. The event will be held from 4 to 6 October in São Paulo, Brazil. Eng. Daniel Hilfiker, President of Pneumofore, will demonstrate the advantages of the Rotary Vane technology in vacuum and compressed air supply with the presentation ‘Efficient Vacuum and Compressed Air Solutions for the Can Industry’ on Friday 6 October at 10:30 AM. 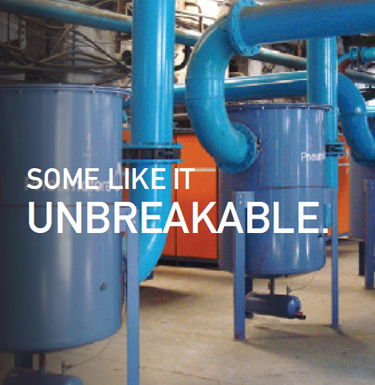 Choosing the right technology is crucial in every vacuum and compressed air installation. Vital as the heart, it must ensure extraordinary durability and reliability. But not all technologies offer efficiency and trouble-free operation in the long term. 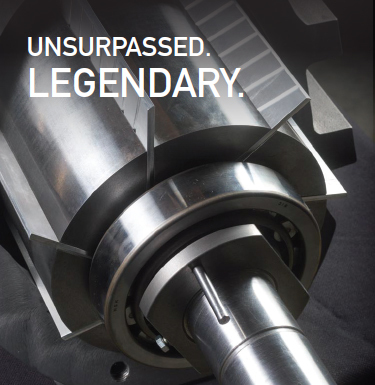 The Rotary Vane technology succeeds even in harsh and tropical environments, where the air-cooled Pneumofore compressors and pumps are the unique solution, as proved by worldwide references like Crown and Ball. The first batch of UV24 VS45 vacuum pumps is on its way to Mexico. These units are delivered in their Hot Climate and Variable Speed version and they will be operating 24/7 for a renowned glass container manufacturer in the Northern part of the country. Recently launched, the UV24 is the first model of the new generation of UV Series vacuum pumps that will be gradually introduced by Pneumofore. With 37 kW nominal power for up to 1.589 m3/h capacity, the UV24 is designed to fit the specific vacuum level required by IS machines in glass manufacturing and by many other applications where centralized vacuum systems are needed for continuous operation. These vacuum pumps are equipped with a new control system and a newly designed cooling system. As for the entire UV Series, the UV24 vacuum pumps are robustly manufactured with a compact, easy-to-maintain design that can work trouble-free even in harsh, hot and/or humid environments. 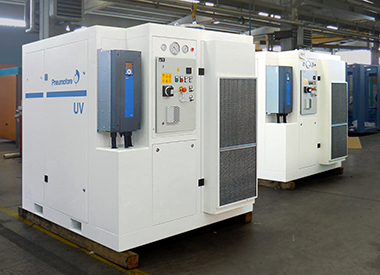 In occasion of the first delivery, the UV24 pumps were painted in white. As usual, customized colors are an option available for every Pneumofore customer. We registered a good affluence to the Pneumofore booth during this years’ event in Beijing, the meeting point for all glassmakers from China and Asian markets. This is the testament of our consolidating presence in the country. As part of our ongoing commitment to the Chinese glass manufacturing industry, few weeks ago we organized a major Technical Meeting in the Shandong province attended by high-level representatives of the country’s leading glassmaking companies and sectoral associations. The meeting agenda included a factory visit to one of our local key customers operating in the hollow glass industry. The event showed practically the important reduction of power consumption achieved with Pneumofore air-cooled compressors and vacuum pumps. Feedback has been extremely positive and several glassmakers, who returned to visit us at China Glass, show now interest to improve more glass manufacturing sites with Pneumofore technology. We thank all those who have visited us! 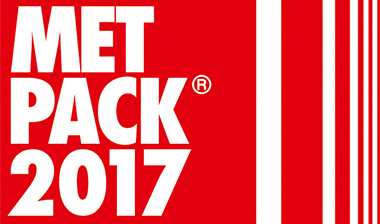 Every three years, the metal packaging industry presents its latest products and innovations at METPACK, the world’s leading fair for the sector. Held in Essen from May 2 to 6, the 2017 edition celebrated its 25-year jubilee and reached new dimensions with more than 300 exhibitors and 7.200 visitors, confirming itself as the most important meeting point for the sector’s market leaders, manufactures and suppliers. The event represented a significant occasion to meet the most important canmakers like Ardagh, Ball, Crown and Can-Pack. Most of them expressed interest in the company’s latest innovations and solutions, all based on the lowest Life Cycle Cost. 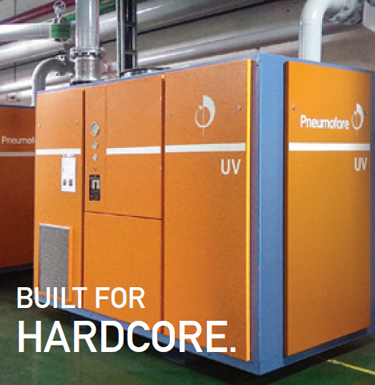 Being the only manufacturer of vacuum and compressed air systems at the fair, Pneumofore confirmed to be the benchmark for the supply of centralized vacuum and compressed air solutions for the can industry. Hannover Messe 2017 has been a thriving edition, with over 6,500 exhibitors and 225,000 visitors which is an unprecedented figure in the 70-year history of the event. As a traditional exhibitor, Pneumofore renewed its presence at the fair’s main hub for vacuum and compressed air technologies, the ComVac show in Hall 26. 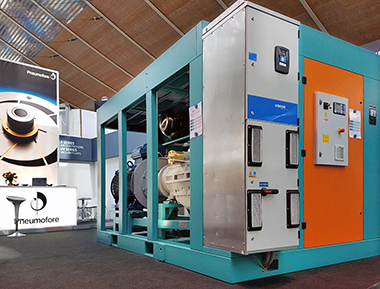 The company was present with an enlarged, newly designed booth and, for the first time, displayed the A400.4 air-cooled air compressor in its low pressure version from 2.5 to 4 bar(g) with variable speed drive. Showcasing the A400.4 unit, the Rotary Vane air-end core elements and Pneumofore’s extensive list of worldwide references was a successful idea that attracted many visitors seeking for alternatives to other vacuum and compressed air technologies. Pneumofore Rotary Vane units are proving daily their constant performance and low Life Cycle Cost by running trouble-free since decades in many industries worldwide, even in harsh or hot climate conditions. With constant focus on innovation and energy saving solutions, Pneumofore looks forward to present new innovative products at ComVac 2019. How Long does the UV30 Pump last? The hour-meter displays more than 124.000 hours of operation. This value corresponds to 92% of the time since the pump’s installation in 2000. The Air End of this unit has never needed to be overhauled or replaced so far. 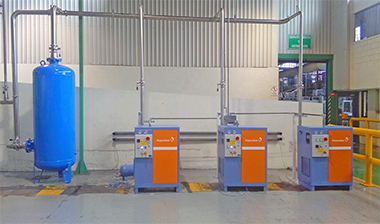 The entire machine had been well maintained with original spare parts, namely the cooling fluid and the three filters for oil, oil-separation and inlet air. This is an excellent result, compared to the former screw vacuum pumps used by the customer, which required repeated overhauling of the screw Air End every 40.000 hours. As a consequence, the customer chose to further invest in Rotary Vane Technology and upgrade its system with a new UV50 vacuum pump. To ease transportation of goods and legitimate trade worldwide, the European Union and an increasing number of Nations have agreed, in cooperation with their customs authorities, to recognize trusted companies like Pneumofore as Authorized Economic Operators. The AEO programme is meant to facilitate trade by avoiding long-lasting, complex, sometimes expensive or even impossible import-export operations. 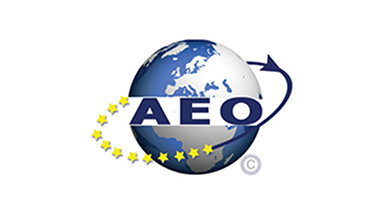 The AEO certification is based on internationally recognized safety and security criteria and it is assigned only to diligent companies active in the global commerce of goods. In 2016, Pneumofore worked towards the AEO authorization, we succeeded and now we are AEO-certified under the number IT AEOF 17 1259. This simplifies and accelerates all our goods transportation operations. For the USA we requested the analogue C-TPAT number. The Customs of most Nations welcome and fully accept the AEO title. Within the ongoing Atex certification process, Pneumofore analyzed the A35 air compressor in terms of vibration, pressure, absorbed power and temperature. Also the dry running test confirmed the CE Ɛx II 2 GD Ex conformity of our rotary vane air-ends used for compression of gas. 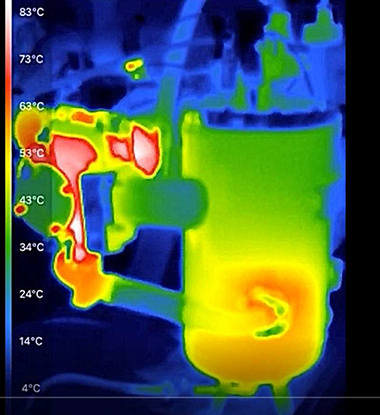 The infrared picture shows the temperature map during the start-up of the “destructive dry running test”, the horizontal air-end is shown on the left. The vacuum air-ends are certified Ɛx II 2 G c T3 (-29°C – +50°C) since 2012 and are successfully running in several (hydrocarbons) Vapor Recovery Units VRU, mainly in Europe and Asia. Five vacuum pumps model UV30 from the year 2000 with 130.000 hours of operation were replaced with three new pumps model UV50 VS90. The new vacuum system was commissioned in January 2017. The control system follows latest standards for the optimized operation of the three frequency-drive equipped UV50 pumps. 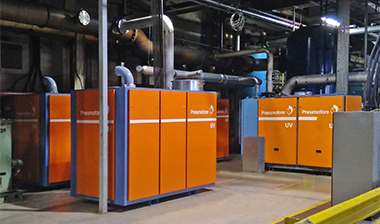 Two UV50 VS90 units with the total capacity of 6.500 m3/h cover the vacuum flow request from production; one UV50 VS90 unit is in stand-by. 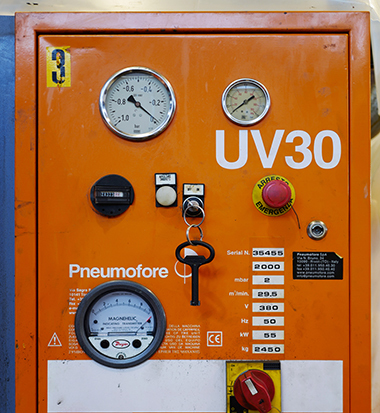 The previous four UV30 pumps are returned to Pneumofore for the total overhaul with a full refurbishment and resale. The collaboration of Pneumofore with the present Ball Group goes back to 1983, to the times of the first American National Can factories in Italy, later NACANCO, later Rexam plants.